300 ft range wireless receiver beeps and flashes when meat temperature reaches your programmed temperature. 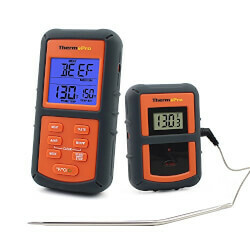 Temperature range of probe: 16Â°F to 482Â°F (-9Â°C to 250Â°C), Â±1.5Â°F/0.8Â°C accuracy, Smart LCD Backlit Screen shows 3 different colors in reactions to different temperature it receives.. The 6.5" food grade stainless steel probe with step-down tip design to get temperature more precisely and quickly, 40" reinforced stainless steel mesh cable. The long cable length, ensures the transmitter won't get splashed by oil.. Cooking thermometer is programmed with preset temperatures for various cooking levels recommended by USDA - Program, ground beef, ground poultry, BEEF, VEAL, chicken, PORK, poultry, LAMB, FISH; All Preprogrammed Temperatures can be reprogrammed to set cooking temperatures to suit your personal taste. FCC certified, CE certified, ROHS, FDA approved probe. 1 Year Replacement Warranty! ThermoPro US Based Customer Service (Phone & Email) 5 Days a Week..